Instead of posting in a random Oculus or PSVR thread, I am always looking for somewhere to post things, like sharing my Void Star Wars: Secrets of the Empire experience. The truth is, VR has sort of become more ends now something of its own category, as opposed to separate concepts. Sure, there are competing platforms, but more and more times, we are seeing collaboration, which is what out will take to keep evolving these technologies to really get to the sweet spot sooner, rather than later. A good example would be the Windows Mixed Reality platform also working with Steam VR titles. There are actually third party apps like Revive, that allow a lot more cross-play. There's a reason that they don't want this stopped. They all need each other to thrive. Why put AR in the same thread? It's still a small category and still emerging, and I believe that there will actually be some convergence with the two, and maybe sooner than we think. Current Windows Mixed Reality headsets use an unwieldy combination of HDMI and USB-C ports, but a new industry consortium led by NVIDIA, Oculus, Valve, AMD, and Microsoft today introduced the VirtualLink™ specification — an open industry standard that enables next-generation VR headsets to connect with PCs and other devices using a single, high-bandwidth USB Type-C connector, instead of a range of cords and connectors. This new connection, an Alternate Mode of USB-C, simplifies and speeds up VR setup time, avoiding key obstacles to VR adoption. It will also brings immersive VR experiences to smaller devices with fewer ports, such as thin and light notebooks. VirtualLink connects with VR headsets to simultaneously deliver four high-speed HBR3 DisplayPort lanes, which are scalable for future needs; a USB3.1 data channel for supporting high-resolution cameras and sensors; and up to 27 watts of power. Details are available at www.VirtualLink.org. The standard will only come to the next generation of Windows Mixed Reality headsets, while current devices will still require HDMI 2.0, DisplayPort 1.2, HDMI 1.4 or DisplayPort 1.2 and USB connectivity USB 3.0 Type-A or Type-C connectors. The very reason why the previous article is important to VR, is twofold. but a new industry consortium led by NVIDIA, Oculus, Valve, AMD, and Microsoft today introduced the VirtualLink™ specification — an open industry standard that enables next-generation VR headsets to connect with PCs and other devices using a single, high-bandwidth USB Type-C connector, instead of a range of cords and connectors. This connects to what I was saying at the start of the thread. I'm really surprised to not see Sony in there, but maybe they simply lack the resources for consortiums anymore. Who knows. The next thing that's important thing is USB-C can be used to charge a portable headset, such as the new Oculus Go; but then convert that new portable headset into a full-fledged VR experience at home, when connected to a PC, using this new standard. Lastly, this will definitely be used in Hololens 2, which is supposed to be announced later this year, with a possible early 2019 release. I have speculated that not only will Hololens 2 be the actual first consumer Hololens (will have to be < $1,000), but using a patent Microsoft has applied for an LCD blocking layer which the main purpose is defined as creating realistic shadows, H2 could actually be the first AR/VR hybrid to market. Of course, most of their waveguide patents claim ~70° FOV, doubling the current Hololens. I do think that 90° should be the minimum for VR. They may or may not have cracked it this gen, but I know that are aggressively going after the hybrid concept, and so are Apple and Google. These companies are spending mad money right now, just to get there and become the OG seller of the next version of "iPhone" gotta-have-it device. Magic Leap is readying their headset for developers, but Microsoft has the development lead by a mile. Why did I look at the title of the thread and instantly think there would be something about He-Man in here? I just tried to spruce up the the with a catchy name. When I realized the similarity with He-Man, I was like even better! I'm ready for AR. If this one dude can do this, I'd like to see what Capcom can do. As I read an article about VR headset sales dying this morning, I see another, an it makes me wonder where this is really all going. Are virtual arcades and virtual theme parks the future? Are our current headsets just the Atari 2600, so to speak? Repelling from a helicopter and zip-lining in VR will have your heart pounding. What better way to tease the world-wide release of the new Tom Clancy’s Jack Ryan series on Amazon Prime then to drop thousands of Comic-Con fans into the boots of Jack Ryan himself. Taking over an entire 60,000 square foot city block, Amazon created a massive event park that places you in the heart of the Middle East. Featuring one of the most extravagant attempts at an end-to-end warehouse-scale VR experience I’ve ever seen—it had everything. Repelling, zip-lining, plank walking, and even a car chase. Over the years, I’ve grown accustom to VR taking center-stage at Comic-Con, experiencing everything from an immersive Blade Runner rideto a Mr. Robot simulcast at Petco Park. But for the most part, the VR demos were usually as simple as putting on a headset and enjoying the ride. Not for Jack Ryan. Jack Ryan loves action—and stomach drops. Upon entering the training park and receiving your Analyst ID badge, the first thing you’ll notice is the Jack Ryan Training Field, an overbearing obstacle course with a life size Bell Huey military helicopter propped a couple floors off the ground. Before entering the immersive “training field,” I got the privilege of watching UFC fighter Ronda Rousey breeze through her run. Geez, I have to follow in her footsteps? Slowly making my way up multiple flights of stairs to gear up in the cabin of the helicopter precariously perched atop a bombed out building made me realize how unordinary this VR experience was about to be. I strapped on a rappelling harness, PC backpack, a modified Oculus Rift VR headset, and hand foot trackers. My heart began to beat faster. Then virtual reality happened. Staff members dressed as soldiers guided me to the edge of the sliding cabin door. In VR, I could see my limbs in front of me as I stutter stepped to the edge. It was clear that I was now flying high over a war torn city. I took a seat and nervously watched my virtual legs dangle in the air off the chopper side. The next thing I knew, I was rappelling out, actually hoisted by a crane down from the safety of the cabin. My heart was racing. Dropping down in a conflict zone under fire made what happened next all seem like a quick blur. I “crossed” a ridiculously long unsteady plank of wood to enter another bombed out building. I picked up a weapon and began engaging with enemies, ducking behind crates that were both physically and virtually there. Walking further down a hallway I came to a balcony. I grabbed onto a zip-line and literally just walked off the side of the building. I land on what could only be safety mats and was quickly ushered into a vehicle where I had to drive myself to safety. What the hell just happened? Keep in mind I was physically walking, grabbing, and flying with a VR headset on, the entire time. I’ve been to location-based entertainment VR centers before, but this was another level. It’s especially mind boggling when you realize that you’re being tracked in VR the entire time with a Optitrack motion capture system and wireless VR headset system. Did I mention that this was all outside under direct sunlight? Created in collaboration with MediaMonks, a team of over 300 worked non-stop over a few months to get this ready for Comic-Con. Quite an accomplishment considering the public will get to experience it this week only. This really should be its own theme park. The immersive Jack Ryan Training Field pushes you to uncover if you have what it takes to become a field operative. And I can tell you, I barely had what it took. It’s a nerve-racking experience that had me questioning my reality in front of me and forced me to push any fear of heights I may have had aside. The Jack Ryan Training Field was also streamed live on Twitch, where viewers could interact and throw challenges in the way of me or others running through the course. On top of the VR Training Field, Amazon also erected a massive escape room that will throw you into your first field assignment. Created in collaboration with AKQA and Unit9, you can dig deep to thwart an extremist conspiracy, uncover a plot of double-crossing, and obtain classified intel. The Dark Ops escape experience is run as a live drama, with actors, voice technology and immersive set pieces. If you’re heading to Comic-Con this week, you’ll find Tom Clancy’s Jacky Ryan experience right outside Comic-Con at the corner of MLK Promenade & 1st Street. The season premiere airs August 31st on Amazon Prime. Acer offers Windows Mixed Reality refurbs with controllers for $150. Camera passthrough FINALLY gets officially added to Windows Mixed Reality headsets. It's B&W, but still really cool. I dig the flashlight method! Maybe gen 2 headsets will include stereoscopic color passthrough, as to add AR capabilities. We know that after Hololens 2, the Kinect sensors on WMR will get an upgrade. After so much hype, Magic Leap today announced that its first mixed reality headset Magic Leap One is available for order in the US for $2295. Magic Leap today also revealed other details about this new headset including its tech specs. Magic Leap One is powered by NVIDIA CPU and GPU, 8GB RAM and 128GB storage. Similar to Microsoft HoloLens, it will only offer up to 3 hours of battery life. Read the full tech specs below. Strange considering its MS funded isn't it? This thing is a complete joke, but what will make it even more of a joke is when Hololens 2 gets revealed (probably by the end of this year), this will be seen as an utter embarrassment and a huge failure. The rumored specs for the actual consumer version of H2 will absolutely blow this away, and for a much cheaper price (rumored). Think bigger than hardware standards! Think... The Oasis! VirtualLink has been developed as an open standard by an industry consortium of leading silicon, software, and headset manufacturers led by NVIDIA, Oculus, Valve, Microsoft, and AMD. This open industry standard for VR connectivity advances VR interoperability and provides economic benefits to head-mounted display (HMD) makers, original equipment manufacturers (OEMs), developers, and consumers. It will accelerate the development and implementation of new VR technologies. Progress. If they can agree on a single cable interface, imagine what is possible with software connectivity. After thinking about this for a bit more, I started to think "how on earth are we to get a metaverse with a single company alone, anyway?" Every type of experience will always be separate. Actually, if there is any competition at all, the most collaboration wins! Sorry Sony! There will be no room for disabling cross-play in this dojo! A closed metaverse will simply fail, imo! It could be so much larger and more robust with a large consortium, anyway. It may even eventually need its own government... Actually, it most definitely will. It will have to have a standard currency (blockchain), will need policing, defense (from hackers), possible voting, etc. To reach Cline’s 2045, developers need to start laying the foundation now for an infrastructure that links each of these worlds. If that sounds idealistic, or even dangerous, it’s not.Think of the days before the internet, when various institutions ran their own walled-off networks. Only when computer scientists came together to standardize protocols did the idea of a single network become possible. Now imagine applying that notion to VR—a metaverse in which users can flit between domains without losing their identity or their bearings as they travel. The OASIS works because it feels like it has no owners, no urgent needs. It’s a utility, a toolkit available for artisans and corporations alike. If we want to realize this potential ourselves—universal freedom and possibility—let’s start thinking about VR the way Cline does: not as a first-to-market commodity, but as an internet all its own. The future is looking pretty crazy. I'll always want a controller in my hand but can't deny this is cool tech. Man this game just feels next level. I keep surprising myself at the tactics people use. It's not super realistic(more than most), but it's so f***ing satisfying to do stuff like this. The controls are awesome. New game centered around Darth Vader. VR exclusive and I think Oculus only for now. Yeah not super realistic but it feels so awesome. Speculation is that the "mind blowing" VR game coming is related to Valve. This interview is over a year old. They're building 3 full games in VR. More on Oculus Quest (formerly known as Santa Cruz) Wireless, stand-alone, 6DOF, "High End" head set for $400 w/ controllers. If this performs well, it will be really great for VR. Oculus says it finally has the right headset to deliver powerful VR without wires or PC. SAN JOSE, California—Facebook used its latest virtual reality conference, the fifth annual Oculus Connect, to finally confirm retail plans for its most ambitious standalone VR product yet: the Oculus Quest. Originally known by its prototype name, Oculus Santa Cruz, the Quest will ship in spring 2019 for $399. In terms of the sales pitch, this is the Oculus holy grail: a wireless, hand-tracked, "six degrees of freedom" VR system with apparently legitimate 3D power and no required PC or phone. 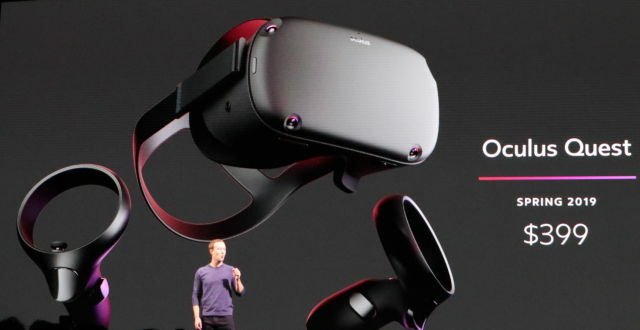 "It needs to be standalone," Facebook CEO Mark Zuckerberg announced about the future of all Oculus products to come, as an indicator of the "ideal form factor" for VR. "Hand presence" and "six degrees of freedom" were required as well. This new headset ticks all three of Zuckerberg's boxes. Enlarge / Mark Zuckerberg talks about efforts to put more people into VR experiences at Oculus Connect 5. That $399 price includes two new handheld controllers that largely resemble 2016’s Oculus Touch product. Zuckerberg promises more than 50 games for the Quest when it launches next year, and when describing the upcoming lineup, he mentioned popular VR fare like Robo Recall, The Climb, and Moss. An additional Quest sizzle reel included logos for games like Superhot and companies like Insomniac and Halfbrick. Oculus says the launch lineup will be revealed "next year." A three-part cinematic Star Wars "6DOF" experience, centered around Darth Vader and designed as a launch title for Oculus Quest, was confirmed by Lucasarts and ILM representatives at the event. "You'll be able to step inside the world of Star Wars in the comfort of your living room and, for the first time, truly feel free," the reps said before unveiling world-premiere footage. The brief snippet of the series, titled Vader Immortal, showed a real-time 3D render of Vader that looked like something from a high-end smartphone. Oculus Quest will not be natively compatible with Oculus Rift software on the PC, but Zuckerberg talked about getting more popular VR games onto the Quest in the future. Another representative clarified that the reverse scenario, of building Quest-compatible games first and porting to Rift, will be a single-button process "with no code changes." Astrobot for PSVR releases next week, from Sony. That is what I think he is referring to. Interesting. Yeah there is a ton of hype behind that and that's one thought I've seen, but for some reason, I think he's talking about something we haven't seen yet. Could be though. You were right. He admitted it today. Glad that the game is getting that high of praise, and is also coming from a console manufacturer. This says a lot about Sony's commitment to VR. 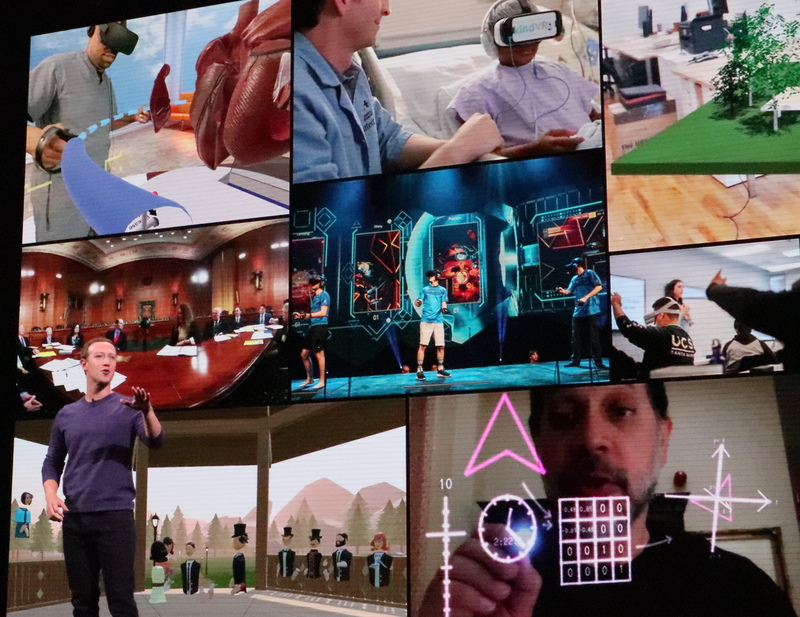 The Oculus keynote show the visual difference between a game on a PC and the wireless standalone Oculus. Impressions are very good visually considering you don't need a PC to run these games. Impressions are really good across the board for Quest. I'm going to start an Oculus Quest thread because it's really a whole new platform, and is a completely new category. People are consistently calling it the future.